Hi guys! I always wanted to try Veganburg in fact 2 years ago, I already discovered this place just I didn't have the time to get my hands on to their burgers. Everytime when my dad drives pass the place, I always have the urge to tell myself that I've got to visit this place one day! So coincidentally, Maria and I had an audition at a production film at Kaki Bukit and we somehow ended up at Eunos, at the point of time we had no where to go for dinner and so just decided to have a healthy fast food meal. The big signboard outside totally just catches my attention. I always have the mindset that junk food are very unhealthy but at Veganburg, it's not. They generally served HEALTHY and NUTRITIOUS burgers and believe it or not, they do not serve any meat. Getting to VeganBurg only requires you to walk a short distance from Eunos MRT and there is a bus stop right outside the restaurant so it's actually located at a prominent area. #OOTD for the day: "Business Casual" for our audition! Even their tables are made from recycled pallet. Had a hard time choosing which burger to eat and the cashier recommended me to try this. Let's start from the freshly cut fries, it wasn't too salty and tasted delicious. This patty is topped with generous amount of mushroom and covered with dairy-free creamy sauce. The patty actually taste like real patty meat but it's actually not, it is crunchy at the outside and perfectly fried. Btw, the bun is extremely delicious kinda tasted like whole meal bread with powderish power sprinkled all over it. A cup of crispy fried potato and spinach balls with pieces of lettuce is definitely a perfect side dish to add to your meal. Crispy in the outside and the potato and spinach fillings inside warm and creamy. The combination of potato and spinach tasted simply delicious. Hahaha I don't how to describe this but it's really very nice! Extremely nutritious and healthy snack, dipped into the chili sauce/mayo sauce to make it even more nicer! Looking at the burger, you already know it's would be very nice! Looks like Maria seems to be enjoying her burger. This burger consist of patty, lettuce and a large slice of pineapple. Each bite you take the sauce of the teriyaki sauces drips out bit by bit. But I don't really like pineapples so therefore I wouldn't try this burger! 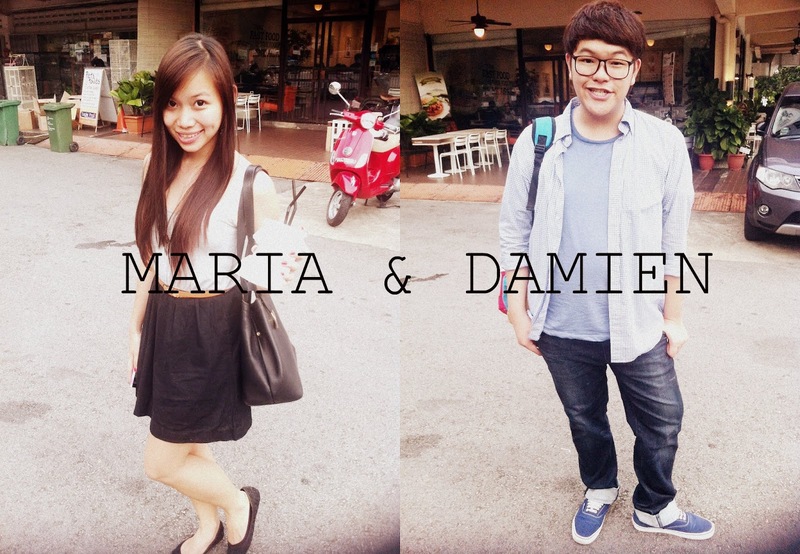 Ending this blogpost with a pic of Maria & I! !